In all the excitement that is going on about VR and AR recently, immersive 3D video headsets have taken a back seat in the media lately. However, this doesn’t mean that good work isn’t being done in the department. Vuzix is one such company that has been involved in such experiences, and thanks to them being located in Oxfordshire, we had a little chance to visit their office and get a demo of the iWear. The iWear is a portable 3D headset that allows you to not only plug into your video player, but also in your gaming console, your gaming PC, or thanks to its HDMI connectivity, any mobile phone or tablet that provides video via HDMI output. Plug and play experience, works with any device that has an HDMI output, no computer or computing power erquired. Noise Cancelling headphones, with 5.1 surround sound. One of the biggest highlights for me while wearing this was how it automatically adjusts if you are wearing your glasses or not. Having tried quite a few of these headsets, this often needs manual adjustment, even in high end competitors units. The demo was given using a 3D rendering of Avatar. The video quality, despite being 720p was amazing. However, just a bit of jerkiness was observed. I was told that the demo unit is one of the earlier prototypes, and the frame rate for video will be improved in the release model. The release model will also come with a better contrast ratio. The device itself was quite heavy on the head. However, the main weight is designed to sit on the head thanks to the forehead piece as well as the headband. The device is designed to make sure no weight is felt on the nose. The sound was very good, and noise cancelling as promised. While visiting the office, I had a chat with one of their staff, who filled me in with some of the details about the product as well as the company. The product was developed in Rochester, New York. Vuzix have been demoing the iWear at various trade shows such as MWC, CES, and will be heading to IFA in Berlin, next. The CEO has 10 years of experience in various optical applications, most of them in enterprise and B2B. The current version of the iWear has been in development for about 8 months. The new version of the iWear will bring full HD (1080p), a better contrast ratio and a higher frame rate. The system will also be built in a better and cleaner environment, giving users a better overall experience. Their biggest competitor on the market is the Avegant Glyph. The product is not designed to replace a TV, rather provide a portable experience thanks to its battery life. One of the most exciting applications for this could be drone racing, where pilots wear this to see where the drone is heading. The company is owned 20% by Intel. 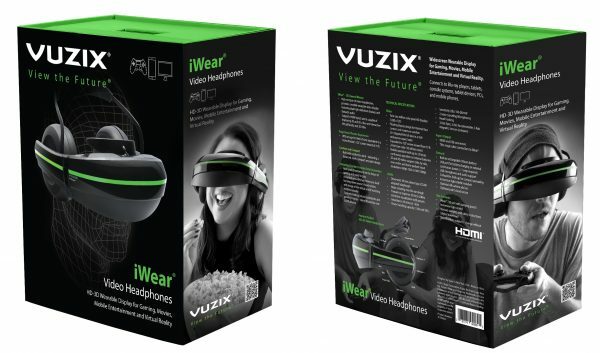 Vuzix will not be entering the VR market any soon, as there are plenty of big players in the market. The system does boast a gyroscope, but does not have a VR protocol. The company makes clever eye-wear in the form of M100 and the upcoming M300 which are already being used by people such as DHL and Tesla. More information on the Vuzix iWear can be found at their website. It retails for £449.99 and once it is fully released (soon), it should be available on a one week lead time. Previous story Review: Madison Optimus Short Sleeve Thermal Jersey – Stay warm while cycling, winter or summer!